and is in PERFECT CONDITION in every way. 99 was the last year of the EVO Evolution 1340 Motor. I have never had to put a wrench on the motor other than changing the oil or installing aftermarket accessories. All Stock Original Parts are Included in the sale. The used Harley motorcycle for sale stored inside a garage whenever it was not being ridden. GoGoCycles also invites anybody who may be having any problems with a 1999 Harley Davidson Fat Boy to leave their questions with a complete description of the exact problem or issues that you're having and your contact information in the space below and see if somebody who stops by may offer a solution for how to fix your bike or a resource for used Harley parts that might save you money. 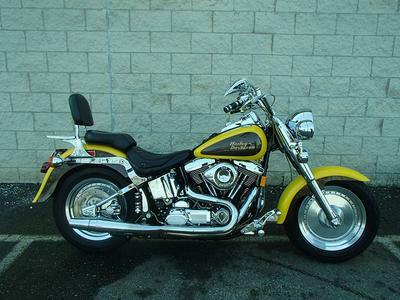 We also encourage bikers to submit their opinions and reviews of the 1999 Harley Fat Boy for sale to help potential buyers make informed decisions and to benefit the biker community as a whole. call me (no e-mail)at 407-257-8five five 8 and don't forget to mention that you found this ad on GoGoCycle's Used Motorcycles and Parts for Sale www.gogocycles.com when you call.